Most of us are familiar by now with the worker-led Fight for $15. This movement has been an important and powerful force for change. But less visible is the fact that most small businesses also support raising the wage. On Saturday, March 12th we will hold a panel to discuss the business case for raising the minimum wage. This panel will be part of the largest U.S. trade show for the natural and organic products industry, the Natural Products Expo-West. Leaders from Dr. Bronner’s, Ben & Jerry’s, and Cambridge Naturals will share their view that not only is raising the wage the right thing to do, it’s also good for business. 11 .m. – 1 p.m. 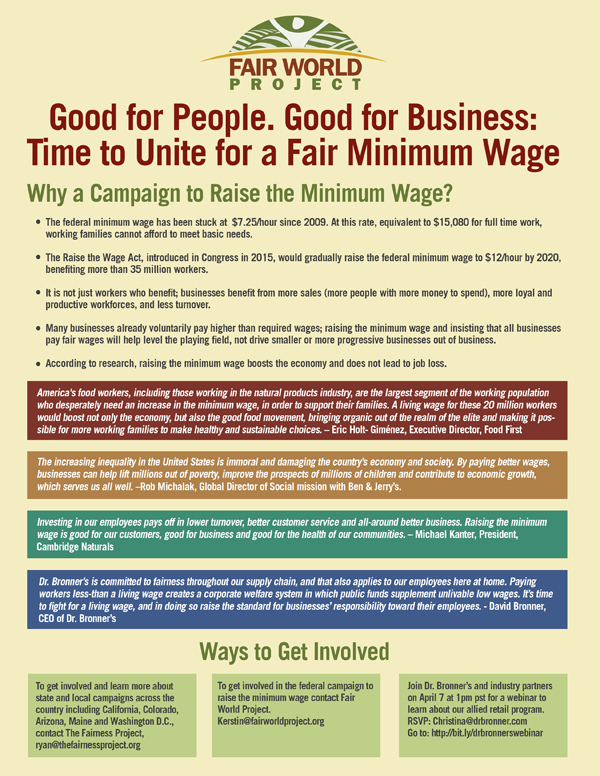 If you cannot join us, you can still learn more by reading this one-page handout containing facts about raising the minimum wage and ideas to get involved. Newsletter 151: Eat bananas, have a job, or own a business? You may want to read this! I am a two time business owner in the transportation industry and let me tell you it’s been rough. I vote for renewable energy, no on fossil fuels, I spent millions in upgrading my fleet to comply with recent emission laws and am supporting raising the wages to $15, I am also trying to afford health insurance for my team and paid vacations however as a tow company, my clients are CHP, PD, AAA and other emergency roadside providers that regulate my rates… they too have limited my increase based on the economy. Please help us too. I am the 98% small business america caught between large corps and employees. We have invested millions of our own money just to stay in business with struggles to remain viable for the past seven years. Don’t forget about all the conscious and wonderful business owners struggling too. I have to maintain monies to afford my liabilities. It’s heart breaking and scary.